What a blessing this year has been to me! I want to thank everyone who has been a part of this wonderful business that God has given me! A special thank you to Laurie and Candy, who I couldn't do this without, each and every Design Team member, every customer, and my DH who is my tech support, CPA, and best friend! But most importantly, I thank God every day for all the blessings HE has given me through this business and my family! I pray for blessings and happiness for each and every one of you! Clear Dollar Stamps and Clearly iStamp will be closed until January 5th for the dreaded job of inventory. You can place orders as normal, but we will not be shipping until January 5th. I am so proud to announce the DT members who will be kicking off the year with us! We are so excited to have each and every one of your and look forward to this new year! 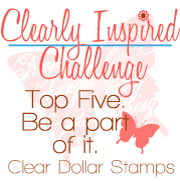 All you need to do is contact me at Lori@ClearDollarStamps.com and I will get your code to you! December 25th, I just had to post Marilyn's email...it was so funny! Merry Christmas, I won my first EVER blog candy... Merry Christmas to me! Thank you, thank you, thank you.... didI say "THANK YOU?" I just wanted to post a few dates of interest! The week of December 21st to 28th, we will be taking a vacation from our blog.....check back on the 30th for a new post from Katie R! Clear Dollar Stamps will be open for you to place orders everyday....even Christmas if you need a break! We will be doing inventory (I hate that word) from January 2nd to January 4th. We will resume shipping on January 5th. I made an error! Thank you to Kim G that pointed that out! I picked the number from the wrong list! Since that posted winner never contacted me, I will post the CORRECT WINNER! It's been a crazy December is all I can say! Here is our winner for the week! Contact me at Lori@CDstamps.com to claim your prize! Congratulations Nanette! We are trying to teach our girls the joy of giving....sometimes it helps to have a visual for them...so that is what I have created this week! The JOY bank helps kids to see where their money is going. The OTHERS slot we plan to use for savings and giving to others when needed. I think they are really going to love these! 1. Use the SU word window punch to punch a hole in the top of your box. 2. Trim side flaps down so they don't interfere with your money slot. 1. Cut papers to fit box. My dimesions were 2.5 x 3.5. Cut 6 of the colored cardstock and 3 of the patterned cardstock. 2. Punch out a four layers of circles as shown. Mine were a 1 3/8 inch scallop, 1 1/4 inch circle, 1 inch circle, and 3/4 inch circle. 3. Cut 1/2 inch strips of colored cardstock and 3/8 inch strips of white cardstock. I then stamped the words on the white and trimmed them down to size. Prepare as pictured. 4. Attach words to patterned paper and tape your solid cardstock to the edges of your patterned paper....there is no overlap. 5. Slide into your box! I left the top and back clear for inquiring eyes to see what is in the banks! Otherwise, my very inquisitive 6 year old will have it apart in two seconds flat! We went to the bank the other day, and in 5 seconds she had the toy broken and in two minutes she had the little plastic spiral piece out of the notebook and pages flying everywhere with her crying! Why would she unscrew the plastic piece from the holes in the notebook???? Why??? LOL! If you want your little banks to be one piece, adhere them together with some two sided tape. You can leave them separate.....dangerous with my six year old that carries EVERYTHING off. My eight year old will be responsible and can have them separate! LOL! If left separate, they can build a tower with them! This is even a good project to make with your kids over Christmas break! Good morning everyone! Its Katie again and today I am lucky enough to share a couple of stamp sets that I use quite frequently. Both sets - Too Sweet and You're So Sweet are stand alone sets, but can also be used together to increase your stamping and decorating options. The strength of these two sets are the stamps that were designed to stamp on those self adhesive mailing labels that happen to fit those delicious Hershey's Nugget candies. I LOVE, LOVE, LOVE, making those cute little nugget boxes as little treats and gifts, but today I want to focus on how YOU can use these stamp sets to their full potential with a little project I came up for Valentines Day. This is a great way to decorate your table for either you and your big honey or you, your big honey, and your little honeys. Its simple, fast, and most importantly fun to do. If you really wanted to you could easily add these to your holiday table too. Lets start with the potential ingredients since its all a matter of personal preference for cardstock, ink, and embellishments. Cut your cardstock 4 1/8" x 4 1/4"
Score along the 4 1/8" side (left to right) at 5/8", 1 1/4", 2 3/8", 3", 3 5/8" OR score at 5/8" + 5/8"+ 1 1/8" + 5/8"
Flip and score at 3", 3 5/8"
Once I have my pieces cut away, I like to cut all my tabs a bit for easier fit. It just works for me. I cut where the dotted lines are. Now its time to decorate. As I mentioned above, these stamps were made to fit self adhesive address labels (Avery 8160), but as long as the sizes are close you can use whatever is in your stash. I picked the stamp design that I wanted, which in this case was the polka dots and stamped right onto the label. Just peel and stick onto the front of the little bag. Then I punched an oval with my punch. I just pushed it all the way flush with the punch and it fit perfectly. Once I had my hole, I cut a strip of transparency (1 1/8" x 2 1/2") to finish my window. Place adhesive on tabs and back and your bag is almost done. Attach handle (4" x 3/4") with brads and insert candy. Cut cardstock to 1" x 5 1/2". Use a 1 1/4" circle punch to cut out label and a 1 1/2" scallop punch for the mat. Attach label to the center of of your long piece of cardstock and wrap to make ring. Cut cardstock to 2 1/4" x 2 3/4". Fold or score in half. I've got a close -up to show you and a couple more examples that I whipped together. Seriously, this is a cute fun favor to put together for your Valentine Dinner that the kids (big and small) will love. * This particular bag only holds 1 nugget and I used a round nestablity to cut out the circle and a piece of velcro to hold the flap down. Here is our winner for the week! Contact me at Lori@CDstamps.com to claim your prize! Congratulations Jan! I'm in the process of making personalized calendars for my family. I made one each for both sets of grandparents. I'm making one right now for my brother's family. I also made 2 cd calendars for the great grandma's and one great aunt. I did these all on the computer with digital scrapbooking. toward any clear stamp set! WHAT CHRISTMAS GIFTS DID YOU MAKE THIS YEAR FOR CHRISTMAS? We want to hear what items you made, whether stamped or not, to give your loved ones! Make a comment on THIS POST and tell me what gifts you made this year for Christmas. Comments will close on Saturday, December 20th, 2008 at 9 PM. I will use Random.org random number generator to select a winner from the comments on Monday, December 22, 2008. I will post the winner no later than Tuesday morning, December 23th. Good luck and thanks for entering to win my blog candy! As CatHouse on SCS, I like to jump in when someone needs some technical or tool assistance, or if they are talking about cats or Macs. I am passionate about both! I also teach papercrafting classes at our local Hobby Lobby's. Teaching classes is one of my most favorite things to do. Showing people things are not as hard as they might appear and watching the delight on their faces as they complete their projects is very gratifying. My next favorite thing is writing tutorials and class materials, which leads me to the jumping off point for this tutorial. This project is one I've called Days to Celebrate or sometimes just the birthday book. This is the book we are doing today. It's a design I came up several years ago to track birthdays and anniversaries of my family and friends. The intent of this design is to allow you to record the year along with the day of a loved one's birthday or anniversary so you will never forget how old they are or how long they've been married. Like I did my brother's 25th wedding anniversary. Sigh. Don't be the only person at the party without a "silver" gift. Big sigh and lots of embarrassment. If you don't need a birthday book, this makes a great tag brag book to show off your children, pets, family, grandchildren, etc. This is going to be a longer tutorial than normal, so put on your seat belts, we're going to drive those stamp pads like we stole them! Here is a list of supplies and tools. I am a VERY thorough, detailed person, so if I thought I MIGHT want to use it, it's listed! (2) 4 x 6 chipboard pieces (Zutter carries these precut in craft and white), plus small chipboard piece for book title, 3 1/2" x 2 3/8"
Outside Covers—Cut two 7 1/2" x 5 3/4" red cardstock pieces, Zutter covers are slightly larger (4 1/8" x 6 1/8"), so your measurement would be 7 3/4" x 6". Inside Covers—Cut two (2) 3 7/8" x 5 7/8" red cardstock pieces, add 1/4" on both measurements if you are using Zutter covers. Library Envelope Covers—Cut (24) 3 1/2" x 4" pieces, 12 each of the patterned paper and 12 of the plain cardstock. PLEASE measure your library pockets before you cut the covers, they vary in size depending on manufacturer. CD Stamps library pockets are 3.5" x 4" not including flaps. Chipboard Covers—If you are not using Zutter covers, use an Exacto knife, cutting mat and ruler (or guillotine cutter) to cut two (2) pieces of chipboard 4" x 6". Book Title—Cut a piece of chipboard, and patterned paper to cover it, to 3 1/2" x 2 3/8". Cut a contrasting piece slightly smaller to 3 1/4" x 2 1/8". Cut a third patterned piece to 3" x 1 7/8". This is the piece you will stamp your title on for the cover. Tags—Finished size of tags should be 3" x 5". If you are using Index Cards, you can cut off the top corners diagonally to resemble a tag, or use a corner punch to create a decorative corner. I used my Cricut and the Tags, Bags, Boxes and More cartridge to cut my tags. I used 6" for my measurement and then trimmed 1/2" off the bottom of the tags. Using the 6" measurement ensures the tags are wide enough for the stamps we will be using. 2. Cut off the flaps of the Library Pockets. Glue one piece of patterned paper to the front of the envelope and a solid piece to the back side of the envelope. Using a Versamagic Jumbo Java ink pad, ink the edges of finished envelopes for an aging effect. Versamagic Jumbo Java is my FAVORITE ink to age with, and I age EVERYTHING! It's an addiction, I probably have about ten or so full size pads and LOTS of the Teardrops to get into the tight spaces. This is where I tell people not to be stingy, to take that ink pad and "drive it like you stole it!" Get wild! 3. At this point, if you would like to stamp on your envelopes to decorate them, this is a good point. Some suggestions might be to stamp the first letter of each month on both sides of the envelope and clear emboss for some dimensionality. You could also stamp pictures that represent each month or stamp Bible Verses on the plain sides. I have several versions of finished books in the Clear Dollar Stamps gallery and in my SCS gallery (CatHouse). 5. Using your folding bone, place the tip under the edge of the cardstock and drag it along the edge of the chipboard to fold the cardstock up along the edge of the chipboard. Apply adhesive to either the paper flap or the chipboard and then use your folding bone to smooth the flap over the edge of the chipboard toward the center of the cover. See the images. Using this method will ensure you have a good sharp fold around the edges of the chipboard. TIP: If you don't have a folding bone, you can use the backside of a DULL butter knife to make these type of sharp folds. Do the same for the back cover. 6. Before gluing on the inside front cover, take your piercing tool and create a hole in the front cover on the short edge to insert the brad. Center the hole 2" down and approximately 1/2" in from the edge of the cover. Insert the brad in the hole about half way and then bend the ends over on the back side. Leave enough space between the face of the brad and the cover to allow you to wrap your closure string around the brad a couple of times. You can now glue on the inside front cover, covering the folded ends of the brad for a nice, clean finish. Glue on the inside back cover. You should now have two pieces of covered chipboard for your book covers. 7. Using a Crop-A-Dile or other eyelet-setting tool, punch a 3/16" hole in the back cover corresponding to the placement of your brad on the front cover. Insert the eyelet with the smooth side on what will be the outside back cover and crimp into place. 8. Take the 6" length of string/floss and fold in half to form a loop. Thread about 1" of the loop through the eyelet from the outside of the cover towards the inside of the cover. When you have enough threaded loop through, take the ends of the string and pull them through the loop and pull tight. This forms the string dangle that you will use to tie your book closed. 9. Take your beads or buttons and thread the string through them up to about 2 1/2" away from the edge of the book. You can use any combination of beads or buttons to create your dangle. To aid you in threading your string through your beads, use the GUM threader to pull the ends of the strings through the beads. See the images illustrating this technique. Sometimes it is helpful to pull one string at a time. After you have your beads positioned, tie a knot at the end and trim off any excess string. 10. Now for your tags! Using the Log-It stamp, stamp on both sides of your tags as close to the bottom of your tag as you can. Make sure that the double column is on the right side of the tag and the single column to the left. The dates will go in the single column to the left. I used VersaFine Onyx Black as my ink color for the grids but you can use whatever darker color you like that matches your papers. I use the Versafine inks as they reproduce fine lines a bit more cleanly than heavier pigment inks do. TIP: I know stamping on paper that has been cut to size can be tricky, so I take a heavy sponge rubber mouse pad and flip it over so the rubber side is up and place my cut paper on it. It tends to "grab" the paper and helps to keep it from floating around on the surface when you go to stamp with a stamp that covers most of the surface the way the Log-It stamp does. Hope that works for you! 11. Switching to the Days to Celebrate stamp set, you will see two sets of number stamps in a vertical orientation. Take the 1-16 set and stamp those numbers in the left side single column. Flip the tag over and stamp the 17-31 numbers on the back of the tag. TIP: Remembering that not all months have 31 days, here is how I keep myself straight and have just the right numbers for each month: Ink the 17-31 stamp only up to the 28th (or 29th if it's Leap Year) and stamp your tag. Then you need five tags that have only the 17-30 on them. Ink up your stamp up to the 30 and then stamp five more tags. Now you can stamp the last six using the full stamp. 12. To stamp the months on the tags, we are going to use the month stamps from the Coaster Calender set. You could also use the months from the Vintage Flourish Months stamp set, they are more decorative. Position the month stamps about a half inch up from the grid, but try to keep them consistent in placement from tag to tag. Stamp both the front and the back of the tag with the month so you can see the months from wherever your are in your book. 13. Using your hole or slot punch, punch a hole for the ribbons at the top edge of the tag. If you use your Cricut for your tags they way I did, it cuts a slot for you. Handy. I used two different colors of ribbons for my tags, but you can use any kind of fibers, ribbons, yarns, etc. that coordinate with your book. I attached my ribbons by using the same method I used to attach the string for the closure. You can also staple them or use glue dots, whatever you like! 14. Now for the binding. I used the Zutter Bind-It-All (BIA) to bind my book. If you don't have a BIA, see an alternative method of binding at the end of this tutorial. Using your wire snips, measure off six loops on your O-Wire and clip. I used Antique Brass 3/4" Wire. Take your covers and center them in the BIA and punch the six holes. Do the same for all the library envelopes that you have covered. Make sure your tags are NOT in the envelopes! Since we are binding the short edge using the default six holes, you don't have to do a lot of measuring, just center and punch!. 15. Per the instructions that came with the BIA, place your covers and envelopes on the O-Wire and bind. For detailed instructions and tips on how to use the BIA, check out this web site: http://www.zutterzisters.com/Tips.html. Lots of tips and great ideas for using your BIA. After binding, insert your tags into your envelopes, and then tie the book shut. This will give you a good perspective on how to place your book title on the cover. 16. Lets move on to the book title now that we are done with the binding. You need to get that Jumbo Java back out (vroom, vroom!) and go to town on the three pieces of paper AND don't forget to ink the edges of the chipboard too! Age it all! Using your favorite adhesive (I used a glue stick), glue the largest piece of paper to the chipboard. Then glue the smallest piece to the last piece left. 17. Using the Versafine Crimson Red, take the Days to and the CELEBRATE stamps and position them as shown on the picture and stamp the title in the middle of the two pieces of paper you glued together. Heat emboss using Clear Detail embossing powder. Turn this piece over and apply dimensional adhesive on the back and then center and attach this piece to the covered chipboard piece. It is hard to see the dimensional nature in the picture above, but it's there (I used 1/16" thick foam) Using glue dots or other strong adhesive, attach the title piece to the front cover, centering between the brad and the binding. Squish'er on. 18. Now for the fun part! This usually takes me the longest because I also have a ribbon fetish. TOO MANY CHOICES! OK, deep breath in, and start cutting ribbon to decorate your spine! Some fun ideas are to cut some long and some short. You can even thread on some beads to match your book or use premade tassels along with your ribbons. My local fabric store has beaded tassels. Oooh, my! I try not to think about it. I'll be broke before the new year even starts! My DH makes me cover up my eyes when we drive by the fabric store. I think he's overreacting. :-) Just the same, you can NEVER have too much ribbon, so go for it. I'll post my finished book with ribbons later today. Like I said, this takes me FOREVER because I just can't decide when to stop! use two (2) 1 ¼” book binding rings. Use the Crop-a-Dile or other method to punch holes in the covers and the envelopes and insert the rings. Measure in approximately ¼” from side and approximately 1” in from top and bottom of book and envelopes and punch holes. Insert the rings and snap together. Tie ribbons to rings and then insert tags into the envelopes. Be sure you do not insert your tags before you punch holes! I hope you have enjoyed this tutorial and I look forward to papercrafting with you all again soon!